When I was little and hesitant to try something new for the first time, my Dad would always say, “start with what you know.” It’s no surprise that I’ve adopted this same approach with my boys when it comes to trying new things, especially food. If your kids have never tried sushi, they may not want to begin with raw fish. Our boys started with cucumber rolls (Kappa Maki). Most kids like cucumbers and rice so it’s hard to go wrong. Our boys also love edamame, spinach gomae (steamed spinach in a sweet sesame sauce), mixed green salad with miso dressing, agedashi (fried) tofu and udon because they started with what they know…veggies, tofu and noodles. Rinse rice until water runs clear. Place rice and water in a rice cooker or a medium saucepan over high heat and bring to a boil. Reduce heat, cover and cook for 15 minutes. Remove from heat and let stand for 10 minutes, covered. Heat rice vinegar in a small pan over low heat. Stir in sugar and salt until dissolved. Transfer rice to a large glass or wooden bowl and gently toss the vinegar mixture with the rice. Let rice cool to room temperature before using. Spread a little bit of rice on a square of nori or a soy wrapper. Top with your fillings. Fold over or roll up and enjoy! And remember, great sushi doesn’t have to be complicated, but it should be fun, colorful and delicious. "Start with what you know." That can apply to so much in life, can't it? That could go on a plaque in every kitchen, in every office, in every dorm. I love sushi so this is a "must try" for our little ones (and maybe the husband, too). Our little clan is made up of picky eaters BUT they do love the veggies. 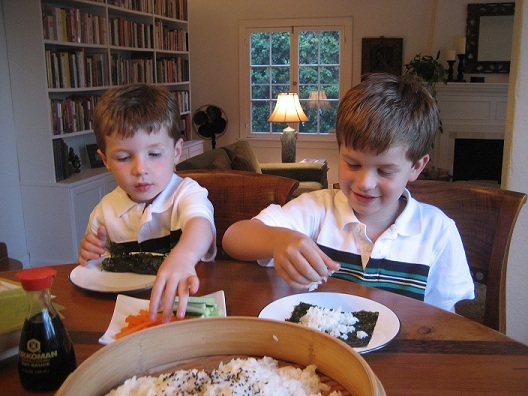 I can't wait to plan a sushi night with my little one ...thanks for the tips and the recipe!!! Thanks Jen! I agree. Who knows? Maybe our picky eaters will become gourmands one day.